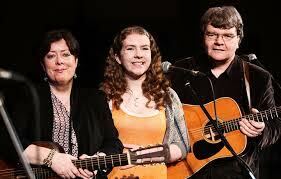 GREENSHINE is a family trio comprising Noel Shine, Mary Greene and their daughter Ellie. Their material straddles the boundaries of contemporary, folk and roots and includes many self-penned songs. Their fast picking and close harmonies are a treat to the ear. Noel is a multi-instrumentalist, turning his hand to guitar, bass, mandolin, bouzouki and traditional whistle and this musical dexterity had seen him much in demand as a session and band player by artists as diverse as The Clancy Brothers and Tommy Makem and funk and soul legends The Republic of Loose amongst many others. Mary brings rhythm guitar to the mix and her voice is a wonderfully versatile instrument. She is much in demand for her recording session work and has added her talents to the albums of Christy Moore, John Spillane, Mick Hanly and Frances Black as well as cult psychedelic outfit Dr. Strangely Strange. As a duo, Noel and Mary have released 3 critically acclaimed albums to date ~ The Land You Love the Best (placed no. 3 in The Irish Times Folk albums of the year of its release), Unspoken Lines (described as ‘The heart and soul of folk music, coming from a deeper well…,’ by John Spillane) while Mary’s solo, Sea of Hearts, earned an impressive 8 out of 10 in Hot Press. Ellie Shine has grown up surrounded by music and has been performing in concerts and festivals since the age of 13 including an appearance with GREENSHINE for President Michael D. Higgins and his wife Sabina at The Abbey Theatre. Despite her tender years, Ellie has featured on 4 recordings to date. She has a huge interest in the songs of the Muskerry Gaeltacht and reached the All-Ireland final of Fleadh Cheoil na hEireann’s under 15 Sean-Nós Singing competition in her debut try-out. She enjoys singing songs of all genres and has a special place in her heart reserved for classic Beatles and country as well as good contemporary songwriting. She accompanies herself on the ukulele. 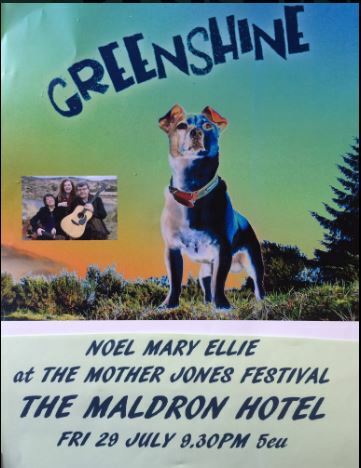 The music of Greenshine has been covered by several Irish music artists and has been used commercially by Follain Preserves in their ad campaigns, Carrie Crowley in her film Waterway and as signature tunes by several national radio station programmes.